The Attends Care Body Milk and lotion can be used on both body and hands to provide the moisture the skin needs. It has a long-lasting formula to lessen the need for additional application during the day. 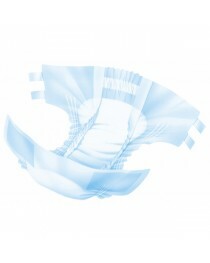 The body milk formulation can be used directly after showering or bathing. This rich cream will absorb nicely into the skin and provide a protective barrier from further dryness, without greasiness. This formulation contains natural ingredients that aid in soothing dry skin and encouraging skin cell regeneration. The wheat germ oil provides additional moisturizing properties, while the chamomile provides soothing properties. This formula is 100% alcohol-free so it won’t dry out your skin. It’s been formulated to avoid adverse skin reactions or allergies, and is safe to use on all types of skin—normal, dry, oily, or combination. It can be used for every age range too. The cream also serves a secondary purpose in providing a protective layer to sensitive skin. People will find protection from inclement and drying seasonal temperatures. The lotion will last a long time on the skin, but can be applied as often as needed. 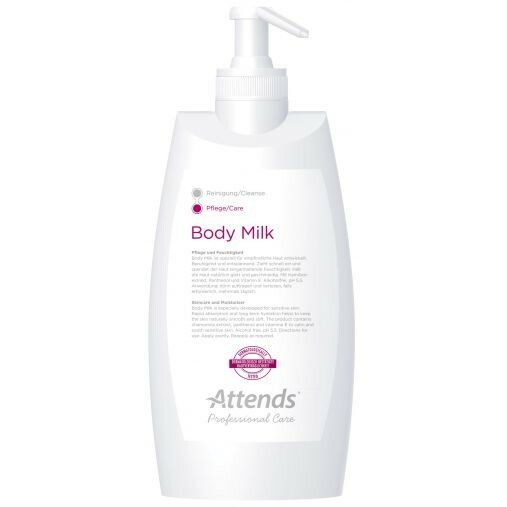 The Attends Body Care Milk will assist in skin regeneration, and help to treat dry skin in specific regions of the body, including, hands, elbows, knees, and feet. It can also be safely used in intimate regions. The lotion can be used on every region of the body, but avoid the eye regions. Before using, ensure your hands are clean and dry, and that you have had a shower or bath. Pat skin dry and apply. This formula contains chamomile extract to soothe the skin and decrease skin irritation or redness after bathing. It’s contains a pleasant and gentle perfume. Other ingredients include allantoin, D-Panthenol, and wheat germ oil. The lotion is sold in a large white plastic 500 ml bottle that will last for a long time, and is contained within a secure bottle design that won’t tip over. It’s basic white design will fit on any vanity or counter. The bottle has a simple pump dispenser to release the lotion. It can be twisted to a locking position so you can pack it securely for shipping to your location, or for when travelling. • Soothing and gentle moisturizing formula. • Contains chamomile extract to sooth skin.